The Mandalorian will be one of the first original series premiering on Disney+, which will cost customers $6.99 per month when it opens for business November 12. A live-action Star Wars series will be one of the many ways Disney is drawing customers into their streaming app. For that reason, expectations are high. The panel opened with Lucasfilm President Kathleen Kennedy, series creator Jon Favereau, and director Dave Filoni welcoming the crowd and thanking them for a successful weekend at Star Wars Celebration. Pedro Pascal, playing The Mandalorian himself, was the first to take the stage. He was joined by co-stars Gina Carano and Carl Weathers. Weathers is a character named Greef, a guy who’s running a group of bounty hunters. He’s looking for someone to go after — a product to bring to a client who’s worth a lot. That’s when he encounters The Mandalorian, who Weathers’ character hires to get the job done. 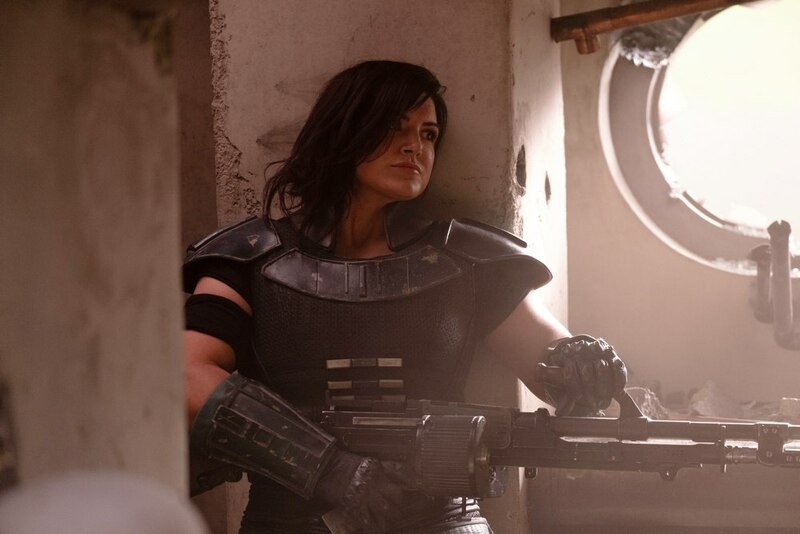 We were treated to the first footage from The Mandalorian and saw Pescal’s character seemingly tracking someone down. In one scene The Mandalorian was riding a Dewback. Plenty of exciting behind-the-scenes footage was shared, and we even saw a shot of George Lucas on set. The impressive footage received a standing ovation from the audience. 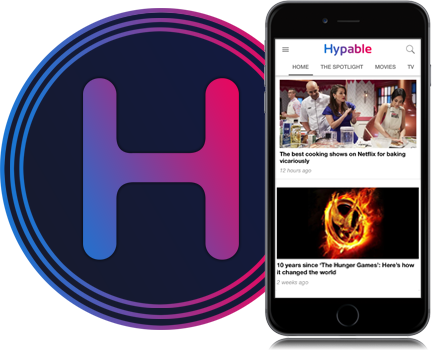 The show looked like a high-caliber production that shouldn’t be ignored just because it’s hidden on a streaming app. It’ll be set five years after Return of the Jedi. One thing that was repeatedly emphasized was that The Mandalorian will be accessible to everyone. You won’t need prior knowledge of the Star Wars world to jump into this series. That said, the crew promised the show has plenty of details for those who’ve followed the franchise for so long. 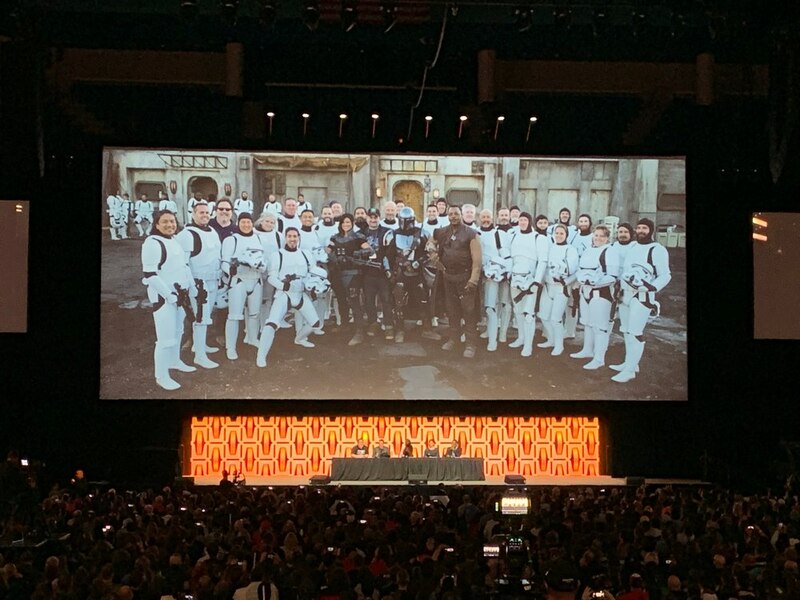 Favereau revealed that the 501st Legion, a real group of fans who have Stormtrooper suits, came down to the set to be a part of filming when the production needed more of the characters on set. The thing was, the fans weren’t told in advance what they were being brought in for and were genuinely surprised. (Typically they’re called in for various events like Star Wars Celebration, but not to be a part of filming.) Filoni said the Stormtroopers ended up being a test audience for the crew. As they rolled out set pieces, the Stormtroopers gave them instant feedback on whether the fans would approve. Faverau had been talking to Kennedy for years about moving forward on this series, and when Disney+ came into existence they decided that it was time to give it the green light. Faverau said he looked to Filoni for guidance when creating the series. He wrote four episodes and sent them to Filoni, who realized that Faverau really had a lot of time on his hands. The pair agreed that The Mandalorian was a worthy project. They also touched on Lucas visiting the production. Filoni said he wouldn’t have considered doing live-action without Lucas’ guidance. Carano said that Faverau would tear up on set when he was talking to the cast about the importance of certain scenes. She said filming sometimes ran for 17 hours a day, but knew it was worth it because it was Star Wars. “The only person who wasn’t having any fun was Gina’s stunt double,” Faverau added, “because Gina was doing all the work.” They told one story about Gina actually dragging a wounded warrior (who was a real human, not dummy) in a scene. The topic next turned to the inspiration behind The Mandalorian’s character. Pascal said the lead has a lot of Clint Eastwood in him. “It was an incredible thing because — when Jon asked me to come and meet with him about something Star Wars… [I entered and] it was wall to wall story illustrations. You wouldn’t believe what I was seeing. I was born in ’75 so I am a product of Star Wars imagination. I was shaped by these movies. And I was like, ‘What do you want me to do? Who do you want me to audition for… a bug or a robot?’ [Jon] was like, ‘You’re The Mandalorian. '” Pascal then threw himself on the panel table, reenacting the feeling of being overwhelmed in the moment. When asked how The Mandalorian would be different from other Star Wars properties, Filoni was hesitant to get into details. All they would say was that it was the first live-action Star Wars TV series to exist. “It’s no cartoon,” quipped Pascal, getting some negative responses from the audience who love the animated Star Wars shows. The panel then said goodbye to the streaming audience, and treated the in-person audience to several more minutes of footage from The Mandalorian. There was a funny minute where Faverau said goodbye to the streaming audience, and the in-person audience started leaving too. Faverau called them back, and we saw a scene in which Weathers’ character is bartering with The Mandalorian. We also saw footage of Carano pulling off some great stunts, and a line from Breaking Bad alum Giancarlo Esposito. “First time seeing that and blown away man,” Weathers said. “I don’t even have words,” Carano added. 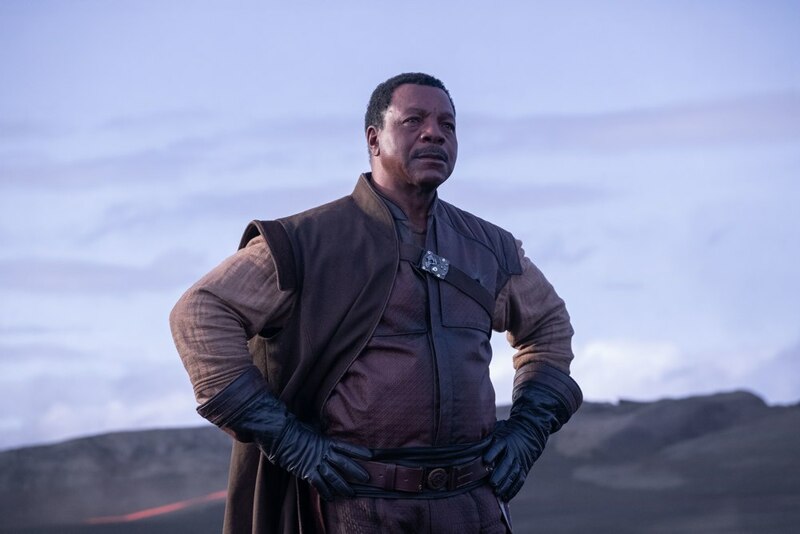 The Mandalorian panel was the third major presentation at Star Wars Celebration 2019, following events for Episode 9: The Rise of Skywalker and Galaxy’s Edge on Saturday.